THERE are varying levels of cleanliness in our house, and without wishing to gender-stereotype, the boys can get rather smelly at times. However, there’s nothing like sudden unavailability of hot water to make people realise just how whiffy they’ve become – and how reliant we’ve become on the shower. When our hot water pipes froze over the weekend I wondered whether we’d ever be accepted into polite society again. One of our sons has worked out that short daily showers before school keep the spots under some control, while another will only shower after sport, and there hasn’t been much of that recently due to the weather. Son three would happily go a week without a wash if he were allowed to. Daughter will take ages over any type of washing, but is also happy to accept a wet-wipe over the face and hands if time is of the essence. Thankfully, this is one of the few areas of life she’s not too fussy about. We didn’t realise the hot water had gone until quite late in the day on Saturday because, well, it was the first Saturday in ages we hadn’t had to be anywhere or do anything. So were all slobbing about in our pajamas until lunchtime, and our basement kitchen taps had been working perfectly. Our hot water pipes froze during last winter’s snow, but had thawed out after I’d scrambled about on my hands and knees for a few hours under sinks, armed with hot water bottles and a hairdryer. Not this time. Not so much as a drip. Now any normal person might have just called it quits and accepted that the pipes were going to stay frozen for at least 24 hours. A normal person may have just boiled a couple of kettles for a wash. A normal person might have continued to slob out for the day watching the Saints and England rugby matches on TV. But no, I had to try to beat the pipes. We needed to have showers. I drove to Argos and spent £40 and probably a lot more electricity on two fan heaters, and by the time the kids had gone to bed – filthy – the house was like a sauna and the pipes were still frozen. We turned off the heaters, made some hot water bottles and went to bed. I lay awake trying to think up a Plan B. We’d get up early, go to the Mounts swimming baths and have a shower. Like people did when their loos were still outside and baths were copper and placed in front of open fires. The next morning, early, I woke up to the sound of running water. Hot water. Running. No need for Plan B after all. By lunchtime everyone was clean and we were all slobbing out watching the rugby. Sometimes I think I worry too much. WE seem to have missed out on the heavy snow falls that have ground the rest of the country to a halt over the past fortnight. However, the cold has been painful. And with an erratic boiler, frozen pipes and the immoral rise in fuel bills inflicted by the greedy gas and electric companies, I’ve turned into my mother. This means recalling all the things she did in the 1970s to keep our house as cosy as possible. Draught excluders, curtains over doorways, hand-knitted jumpers and extra blankets, yes, blankets on beds. I’ve so far resisted putting up cling-film on the windows, as fashioned by my dad circa 1978. I do have some windows that aren’t double-glazed, so I’m not completely ruling it out. We’re a pampered generation, what with our combi-boilers and 15 tog duvets. We’ve become used to mild winters where we still have to mow the lawn in January. But this winter has been proper chilly. Brass monkeys. Wish-I’d-remembered-my-gloves weather. At the time of writing, it’s minus 4 outside and I’m wearing a hand-knitted poncho. In green, with a hood. It was intended for summer camping use and hand-knitted by my mum after she made some cute ones for Bonnie. But it’s so toasty, and so much better than those awful fleecy blankets with sleeves which give you electric shocks from the static. I’ve tried to convince her to make lots and sell them on eBay, but she’s too modest, and thinks no-one would want them. Even Bloke wants one. In black. Keeping the heat in when you live in a house built in 1880 is tricky. The ceilings are high, the ill-fitting doors positively encourage wailing draughts, and some rooms don’t have radiators (like our downstairs loo, which is so cold it might as well be outside). But it’s surprising what a difference a few old-fashioned tricks can make. You can buy nail-on draught excluders which have a brush at the bottom but I’m not sure they work as well as a sausage-dog stuffed with rags and lentils. Or a knitted snake. Or a pair of old tights stuffed with strips of old towels. In the 70s, when we had storage heaters which only warmed up at night, Mum actually stuffed rags in keyholes. Doors can be insulated with extra curtains. It doesn’t have to be flash. We’ve used a couple of screw-in hooks and hung a blanket over one. Another has a spring-action net-curtain pole with an old tab curtain hanging from it. It’s not pretty, but it does the job. We’ve stuck our summer duvet over our winter duvet. The kids’ beds have fleece blankets over their duvets. They kick them off during the night but at least they start warm. And there’s a lot to be said for hot-water bottles and slippers. Ah, slippers. So under-rated. The older boys believe they are far too cool to wear them, but Billy and Bonnie were more than happy to shop for slippers last week, and now have toasty toes. 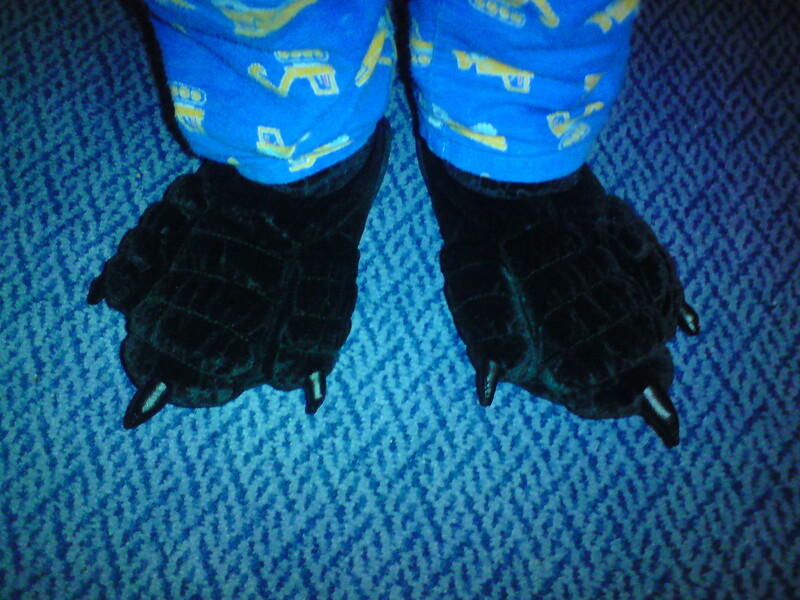 Mine are cow-print, Bonn’s have pink fairies on, while Billy’s are shaped like monster feet. Perfect.